We're back! Yes, we are back from vacation and we have two posts for y'all. :) But first off, Happy Easter everyone! For Christ our Lord has Risen!!! The first post is of the interview I had with Olivia. The first place winner from the Keeping it Classy fashion week. Olivia is adorable, quirky, fun, and has a great sense of fashion! She is also someone Gabrielle and I would love to meet someday. Sometimes we wished she lived near us and we could sew together. :D Wouldn't that be fun, Olivia? Now onto the interview! Ashley: First off, tell me a little bit about yourself. Olivia: My name is Olivia, I'm 18, mostly blonde, and rather short. I love warmth, lace, and mud. Sewing pretty much could take over my life if I let it. I share my adventures with patterns and pintucks on my sewing blog, Working With Eager Hands. My family moved to rural Tennessee a year and a half ago and I love the life God has given me more and more each day. Moving to the country has been a huuuge adjustment for me, but I wouldn't have it any other way. Ashley: When did you get into modesty & fashion? Olivia: *contorts face and tries to remember* I think somewhere around age 14? I had spent the previous 3 years of my life in sweats and over-sized T-shirts. Something "clicked", I guess, because since then I've been obsessive compulsive about modesty and fashion! Ashley: What is your biggest fashion inspiration? Olivia: This question has two answers. :) My biggest real life fashion inspiration is all of the wonderful down-to-earth friends I have. Some are online, some are in real life, but they've all shown me that style is not something that comes from a runway, but is something that is rooted in a faithful heart and a thoughtful womanliness. Practicality can be beautiful and real style is encompassing them both. The other answer to this question is shopRuche.com. I gain so much sewing and whimsical inspiration from their LookBooks. Their mostly modest styles are always charming and feminine. Ashley: How would you describe your style? Olivia: I'd say my style is a mix of Audrey Hepburn and Seven Brides for Seven Brothers. Classy, country, and cutsey. Denim with lace, bohemian with pearls, diamonds with rainboots. Ashley: What are your some of your favorite pieces in your closet? 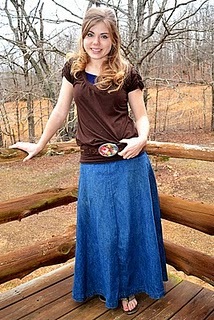 Olivia: For summer, I find myself wearing an upper-calf length tiered/gored denim skirt with matching lace that I made last fall. It goes with everything and is the perfect blend of modest and cool for these warmer months. Black sweaters, nicer-looking knit jersey shirts, and fitted dresses are also on my favorites list. Ashley: What do you think about while picking out an outfit each day? Olivia: I think about what I'll be doing that day and who I'll be around. Going to a BBQ or cooking all day requires different clothes than if I were fencing a field or working in the garden. But, to be honest, I rarely stay in one outfit for the whole day. Around here we do so many different activities in a single day that one outfit can't do everything! Ashley: What style blogs do you follow that are favorites? Ashley: What are your favorite movies to watch - fashion wise? Ashley: What are your favorite stores to shop at? Olivia: Before we moved, I would frequent Khol's, JCPenny's, and Target- they were all 2 miles from my house. Now those stores are 1.5 hours away... and I haven't actually been "clothes shopping" since we moved! I do love stopping in to a cute little thrift store we have on our tiny town's square- I've found some really nice name-brand stuff there. My favorite thing about it though is that they have a 25 cent bin where they throw all the slightly stained or ill-fitting clothing. I've been able to alter and use for fabric sooo many things I've found in there. Ashley: Do you have any shopping tips? Olivia: Most people tell you "If you don't love it in the store, don't buy it because you won't wear it"... although this may be true for some things, other times it's worth it just to go for it. Some of my favorite pieces I didn't exactly fall in love with in the store, but once I figured out how to wear it or I altered it slightly, I wear it all the time! Now, mind you, I make it my mission not to spend more than $10 on a single shirt, if possible, so it's not a huge loss if I do end up disliking it. Think outside the box when you're shopping. Instead of going around saying, "I don't like that," "Ewww," or "Who would wear THAT?" try to find the potential in every thing. Instead, saying "Oh, that would be cute if this..." or "This color is really nice" will really help you to find things. 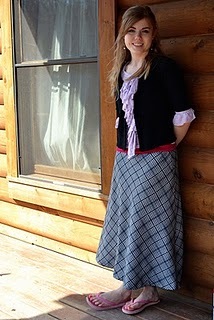 Ashley: What is your advice to girls who want to dress modestly, yet fashionably? Olivia: Get yourself a dozen tank tops in just as many colors. :) My sisters and I wear tank tops under practically all of our shirts and they open up a whole world of cute layering/ making it modest possibilities. Our favorite brand is "Arizona" from JCPenny's. We either sew or tie the straps about 2 inches shorter and then it is the perfect tank! Also, never underestimate the power of doing your hair. It can make or break a whole outfit. Ashley: What are your favorite fashion and/or beauty tips or tricks? Have you discovered any "secrets" that you'd like to share? Olivia: Top three favorite things that will make anyone look more put-together and pretty, in my humble opinion? 3) And a tad bit of lighter concealer dabbed near the lower inner corners and centers of your eyes. Ashley: Any thoughts on how Bramblewood Fashion can be improved? Do you have thoughts on posts, events, or giveaways you would like to see on the blog? I loved this! Thanks for sharing, Olivia. :) I loved it! Olivia's style is just like mine! I wish I could meet her someday...! !